Best Chinese Knives: Budget Tactical Pens - Great tactical gift option! Budget Tactical Pens - Great tactical gift option! One of my knife buddies asked me to find and order a budget tactical pen for him to try out. I've agreed, but with a condition that I will have a chance to review it before I will give it to him. 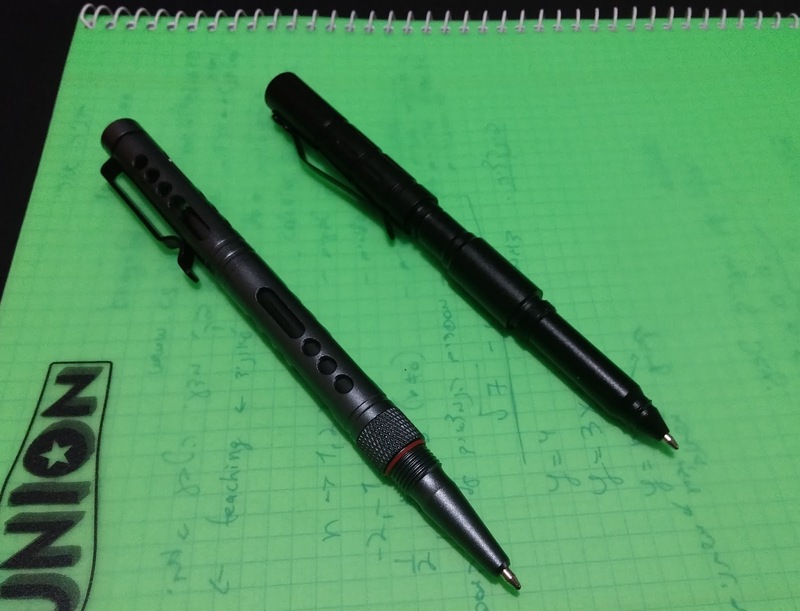 1) The most budget and common version on AliExpress - unbranded black colored Aluminum Tactical Pen. - Great value: this pen costs only $4 but feels more expensive. - Good quality: the aluminum body and the screwing cap give this pen an awesome secure feel that it won't fall apart when carried and used. - Writing: any pen (even a tactical one) needs to write. This pen comes with a black unbranded insert (and a spare black one in the package) that writes pretty well in all directions. The big plus is that the insert is a standard Parker one, so a quality replacement can be found without much trouble. - Pretty good ergonomics - the pen feels good and secure in hand in both open and closed positions. - Pocket clip: feels a little flimsy. - The tip is pointy and doesn't scratch glass - this means it isn't hardened and won't break glass easily. - Comes without a gift box, wrapped in bubble wrap. 2) Perforated gun-metal color unbranded Aluminum Tactical Pen. - Comes in a good quality black cardboard gift box and with a spare blue refill, also Parker compatible. - Also has great value (cost me $7.99) and quality, has rubber bands on all the screwings to prevent unwanted unscrewing. - The tip is made from Tungsten or hardened steel (scratches glass). - The cap can be screwed on the other side. - Writes well, on the same level as the more affordable one. - Not the best ergonomics in the open position. - Would be better with less perforations IMO. The Verdict - both pens will give you or the person you are gifting this pen to (more suited for a man than a woman) a chance to try out a tactical pen, and even if they are not into tactical stuff - they will still appreciate the strong build and can still use them as... pens!